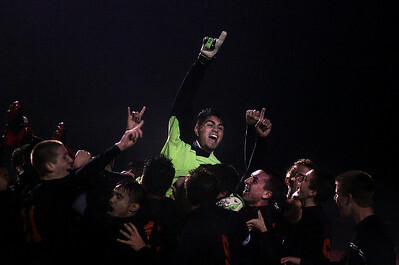 Kyle Grillot - kgrillot@shawmedia.com McHenry senior Frankie Valle celebrates with his team after blocking the winning shot in an overtime shootout during a class 3A boys soccer semifinal match between McHenry and Dekalb Wednesday, October 30, 2013. 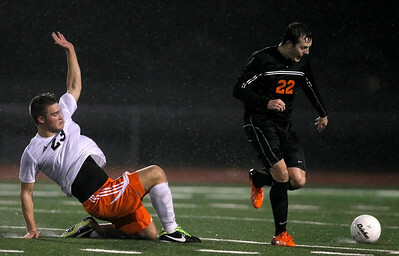 McHenry won the shootout, 4-2, after a 1-1 tie through two overtimes. Kyle Grillot - kgrillot@shawmedia.com Dekalb's Rasmus Hage falls while chasing McHenry senior Kyle Marsh during a class 3A boys soccer semifinal match between McHenry and Dekalb Wednesday, October 30, 2013. McHenry won the shootout, 4-2, after a 1-1 tie through two overtimes. 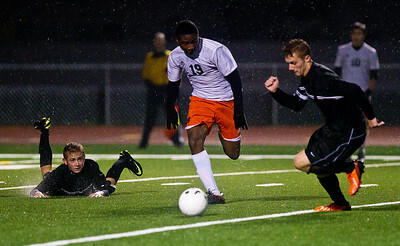 Kyle Grillot - kgrillot@shawmedia.com Dekalb's Eric Ngum fails to stop McHenry senior Ryan Uhl's shot during an overtime shootout of a class 3A boys soccer semifinal match between McHenry and Dekalb Wendesday, October 30, 2013. McHenry won the shootout, 4-2, after a 1-1 tie through two overtimes. 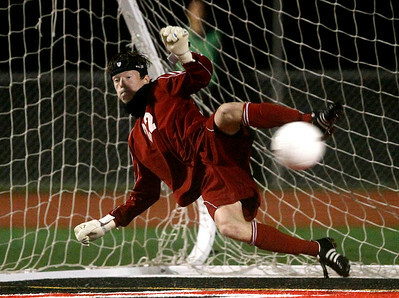 Kyle Grillot - kgrillot@shawmedia.com McHenry senior Frankie Valle blocks the winning shot in an overtime shootout during a class 3A boys soccer semifinal match between McHenry and Dekalb Wednesday, October 30, 2013. McHenry won the shootout, 4-2, after a 1-1 tie through two overtimes. 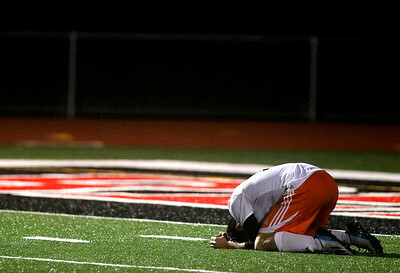 Kyle Grillot - kgrillot@shawmedia.com Dekalb's Sean Woodford falls to the ground after missing the game-ending shot during the overtime shootout of a class 3A boys soccer semifinal match between McHenry and Dekalb Wendesday, October 30, 2013. McHenry won the shootout, 4-2, after a 1-1 tie through two overtimes. 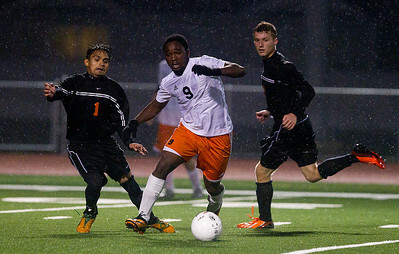 Kyle Grillot - kgrillot@shawmedia.com Dekalb's Akim Suraji fight to control the ball during the first overtime of a class 3A boys soccer semifinal match between McHenry and Dekalb Wendesday, October 30, 2013. McHenry won the shootout, 4-2, after a 1-1 tie through two overtimes. 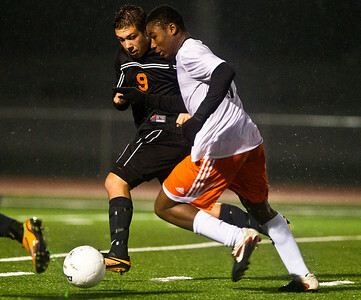 Kyle Grillot - kgrillot@shawmedia.com McHenry senior Ryan Uhl's and Dekalb's Akim Suraji fight to control the ball during the first overtime of the class 3A boys soccer semifinal match between McHenry and Dekalb Wendesday, October 30, 2013. McHenry won the shootout, 4-2, after a 1-1 tie through two overtimes. Kyle Grillot - kgrillot@shawmedia.com McHenry senior freshman James Mulhall and Dekalb's Rasmus Hage fight to control the ball during the first overtime of the class 3A boys soccer semifinal match between McHenry and Dekalb Wendesday, October 30, 2013. McHenry won the shootout, 4-2, after a 1-1 tie through two overtimes. 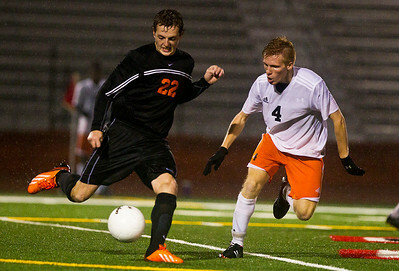 Kyle Grillot - kgrillot@shawmedia.com Dekalb's Skylar Weishaar tries to stop McHenry senior Kyle Marsh from passing the ball during the second half of the class 3A boys soccer semifinal match between McHenry and Dekalb Wendesday, October 30, 2013. McHenry won the shootout, 4-2, after a 1-1 tie through two overtimes. 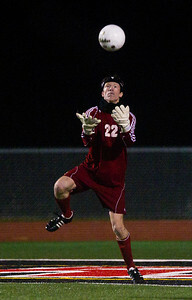 Kyle Grillot - kgrillot@shawmedia.com Dekalb's Eric Ngum stops a shot a goal during the second half of a class 3A boys soccer semifinal match between McHenry and Dekalb Wendesday, October 30, 2013. McHenry won the shootout, 4-2, after a 1-1 tie through two overtimes. 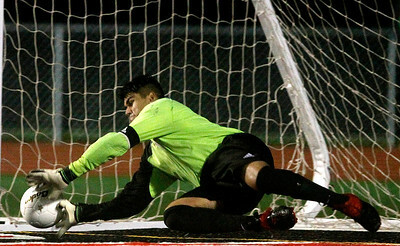 Kyle Grillot - kgrillot@shawmedia.com McHenry senior Luis Beltran tries to catch Dekalb's Stephen Darko during the first overtime of the class 3A boys soccer semifinal match between McHenry and Dekalb Wendesday, October 30, 2013. McHenry won the shootout, 4-2, after a 1-1 tie through two overtimes. 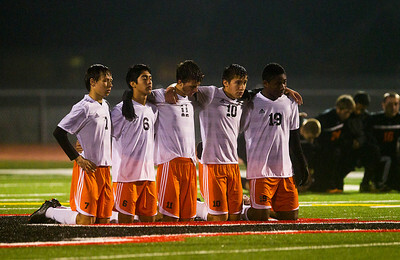 Kyle Grillot - kgrillot@shawmedia.com Dekalb's selected shooters for the overtime shootout wait to start during the class 3A boys soccer semifinal match between McHenry and Dekalb Wednesday, October 30, 2013. McHenry won the shootout, 4-2, after a 1-1 tie through two overtimes. 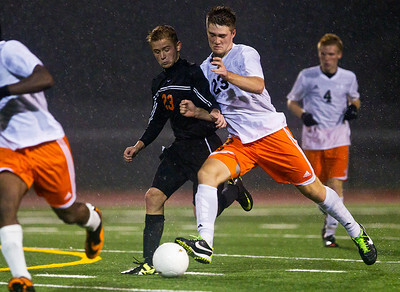 McHenry senior freshman James Mulhall and Dekalb's Rasmus Hage fight to control the ball during the first overtime of the class 3A boys soccer semifinal match between McHenry and Dekalb Wendesday, October 30, 2013. McHenry won the shootout, 4-2, after a 1-1 tie through two overtimes.